Cone point socket set screws or cone point set screws are headless screws threaded the entire length, with a hexagonal drive at one end and a sharp conical-shaped point at the other. Cone point set screws are for permanent setting on soft or hardened shafts. The deep penetration it offers gives this style set screw the highest torsional and axial holding power. 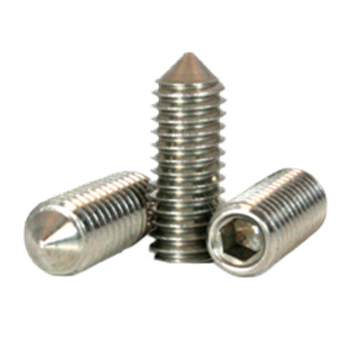 RC Fasteners & Components is your wholesale source for cone point set screws made from alloy steel and stainless steel materials in imperial as well as metric sizes. For locking purposes, see our alloy cone point set screws stocked with a nylon patch.